Just another couple weeks has become a familiar refrain as anglers wait for the colder weather to break and for normal temperatures to arrive. The water temperature is slowly starting to warm and its no coincidence that seasonal species like shark are appearing. With our waters beginning to teem with baitfish, get ready for fishing to return to normal. Redfish are still in bigger schools and have yet to fully break up. Theyve proven to be spooky on the flats and oftentimes we have to wait for a school to swim to us instead of pursuing them. When they do come within casting range, they have been inhaling chunks of blue crab. I use size 3/0 circle hooks making sure the hook point and barb are exposed and let the redfish hook themselves. Weve been eagerly awaiting topwater trout action at first light and are getting ready for dawn patrol missions. My favorite lure is a Heddons Super Spook Jr. in chartreuse and black with their silver mullet color a close second. Try a variety of retrieval speeds as you work these lures. When that trout hits, try to resist the temptation to lift the rod tip and reel the fish tight instead. Its hard to beat those explosive strikes! As expected, sharks have returned to our waters with the warmer water temperatures. Oftentimes you’ll see the fins of bonnethead sharks slicing through the water as they seek out prey. Chunks of blue crab and live shrimp both work well on these predators. Fishing for sharks can be a great way to get younger anglers involved as sharks are usually hungry and put up great fights. 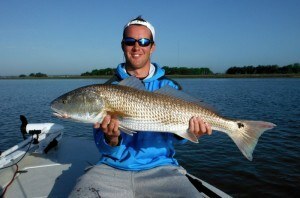 Flyfishermen will begin to focus on tailing tides when big high tides let the redfish way up in the grass. Anglers can see the backs and tails of redfish as they put their noses in the mud to forage for crabs. It will make your knees buckle on the bow of the boat when you see their tails poking up out of the water. Dupres spoon flies have been particularly effective and I like their root beer color.